Last Saturday was a lovely late September day. Sunny, pleasant, with a promise of a cool evening. A perfect day for football and family. I don’t get to my grandson Will’s games often enough, so the visit of his older brother Daniel and family (Daniel’s wife Kayley and almost three-year-old son–my great-grandson–Daxx) from Texas was a perfect opportunity. My daughter Lori, son-in-law Chris, and grandson Hank (who played with Will for the Butler Grizzlies last year but who is at K-State now) picked me up a little before 5:00. Half an hour later we were tailgating (in style) with friends and relatives. 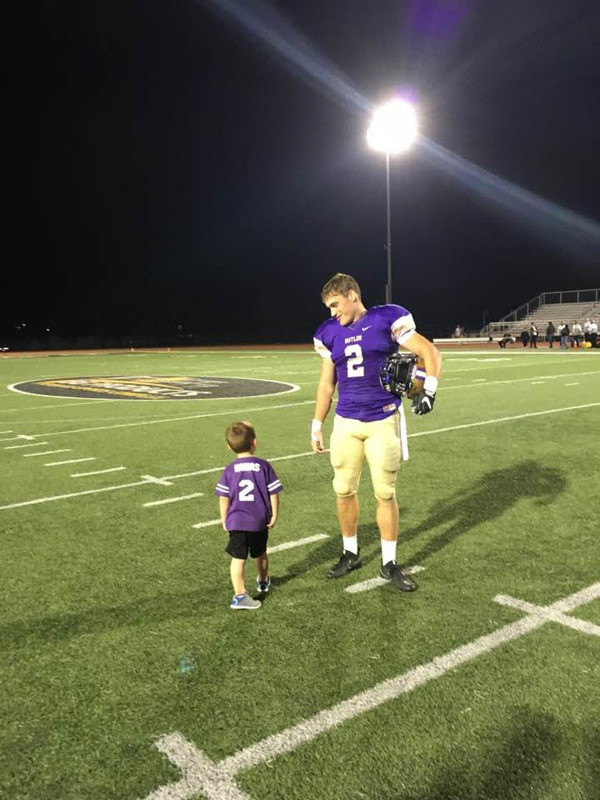 Great grandson Daxx was a bundle of energy, tearing around, meeting (and fist-bumping with) his dad’s old football teammates, watching for his uncle Will and the team enter the stadium, and slapping hands with them as they did. The game was intense, and Butler lost to Garden City in the end. Linebacker Will had a quarterback sack and four tackles. We all funneled down from the bleachers onto the field to mingle with the players. Shook hands, gave hugs, thanked them for their hard work and effort. Took pictures. As things wound down, Daxx found his energy reserves and took to running down the field. Uncle Will joined him. At one point they stopped and stood, seemed to be having a discussion. I shot a couple of quick iPhone pictures, nothing very well-framed or carefully exposed. But the image seemed to me to hold a lot of emotion, of depth. Probably much of it because these two are very dear to me personally, but also, I think, meaningful in a larger more general sense. There are a lot of lines in this image. The field markers, the tall light pole. Will looking so tall, towering above Daxx, but also looking down, head bent, so that he doesn’t seem to loom over Daxx, but to be guarding him, watching over him, protecting him. Daxx, with his legs crossed nonchalantly, seems to me to be basking in his uncle’s attention. And Daxx’s shadows, several of them from the artificial suns of the stadium lights, pointing in so many different directions, but his shadow the strongest where it parallels that of his uncle. Almost as if the shadow is already showing how the influence of uncles, father, grandfathers, is gently nudging him down the path they all found so rewarding. It was a lovely fall evening in late September. I will remember it in great detail every time I look at this picture. I will recall the picture every time Daxx takes another turn down the pathways of his life. I am too old to hope to see his life to its end, but I rest assured that with this family will be there for him, helping him find the right line to follow, the right shadow to lean into. Uncles and nephew, father and son, grandfathers and grandson–all the connections, all the love. It was, and always will be, a lovely day.